Magento is an open-source e-commerce platform written in PHP. Many customers use it to build their B2B or B2C e-commerce platforms. This tutorial explains how to build a Magento platform on a single ECS insgtance. Create an ECS instance. Make sure the instance meets the following requirements: Operating system: CentOS 7.2 64bit. Minimum specifications include 2 Core CPU, 4 GiB RAM, and a 40 GiB Ultra Cloud Disk as the system disk. VPC-connected. If you do not have a VPC network, one will be created when you create an ECS instance. A public IP address is assigned to the instance. Inbound Internet traffic to the TCP Port 80 of the ECS instance is allowed. For more information, see create an ECS instance and add a security group rule. Step 1: Install LAMP on ECS. Step 2: Configure the database. Step 3: Install and configure Composer. 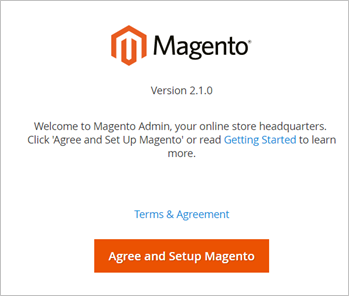 Step 4: Install and configure Magento. Step 5: Test the installation. This section describes how to manually install the LAMP platform. You can also start the ECS instance directly from the cloud market by purchasing LAMP images so that you can quickly build a website. Connect to the ECS instance and install Apache and MySQL. Start Apache and MySQL service and enable them at startup. Configure the Apache configuration file: /etc/httpd/conf/httpd.conf. Add the LoadModule rewrite_module modules/mod_rewrite.so line below Include conf.modules.d/*.conf, and replace AllowOverride None with AllowOverride all in the following section. Press the Esc key and type :wq to save and exit the file. Obtain the temporary password of the root account at the installation of MySQL by running the following. # grep 'temporary password' /var/log/mysqld.log. For more information, see the official documentation. Normally, root should only be allowed to connect from 'localhost'. This ensures that someone cannot guess at the root password from the network. By default, MySQL comes with a database named 'test' that anyone can access. Find the line starting with date.timezone. which is commented out by default, and add the correct time zone. If your site is in China, add date.timezone = Asia/Shanghai. Restart httpb by running the following. Create a database and a user. Run the following commands, including those typed in the mysql> prompt. Run exit to exit MySQL. Download Magento From github using the following commands through git clone. Switch the version of Magento to the stable production version. Move the installation files to the Apache root directory. 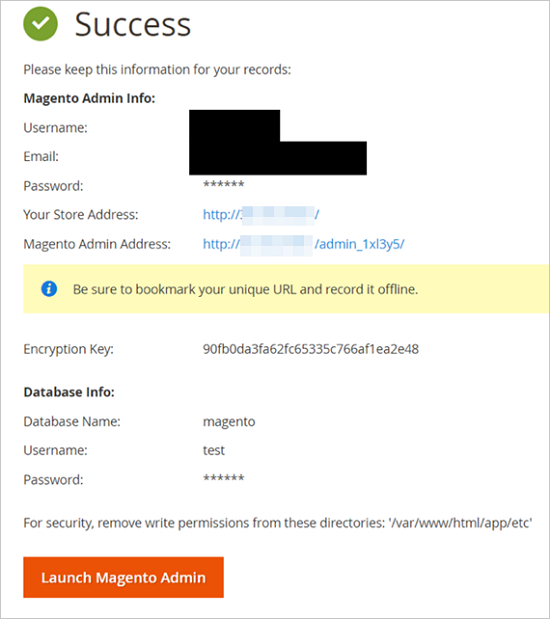 If you skip this step, you will only be able to access your Magento service at http://your-server-ip /magento2. # shopt -s dotglob nullglob && mv /var/www/html/magento2/* /var/www/html/ && cd ..
Run composer install to install Magento. Use your browser to access your server at http://public IP address of your ECS instance. You will see a welcome screen like this one. Click Agree and Setup Magento and fill in the database information, web configuration, and accounts as follows. When you get a page like this, the installation is successful. Run crontab -u apache -e.
Add the following in the /etc/crontab file. Visit http://public IP address of your ECS instance to see the default home page. Visit http://public IP address of your ECS instance/admin, and use the user name and password you set during the installation to log on to the Dashboard. For more information about Magento configuration, see the official documentation.